We see business off about 25-30% from the high over the past year. I suspect it will stay at this level and as of right now it looks like it will not recover until Q1 and maybe not until Q2 next year. 2019 is still expected to be just as robust as it was and depending on the world economy may even be up 5-10%. In short, while we have been managing an industry slowdown, exacerbated by the US/China trade war, the question as illustrated by my contact’s feedback and by this graph taken from the January 2018 post linked above is whether this has just been a cyclical crimp in the rope or a real downturn. Over a one-year period the cycle has continued to consolidate but has not yet gone negative. 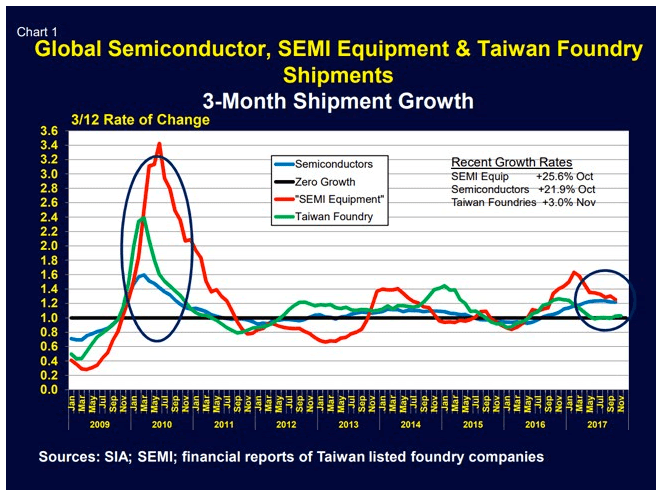 Semiconductor shipment growth (although still positive) peaked in early 2018. Globally it was up only 4.6% in November 2018 versus the same month a year earlier and its trajectory is pointing down. This compares to +23.7% growth in December 2017. That is confirmation that our 2018 view was correct going back to Q4 2017. 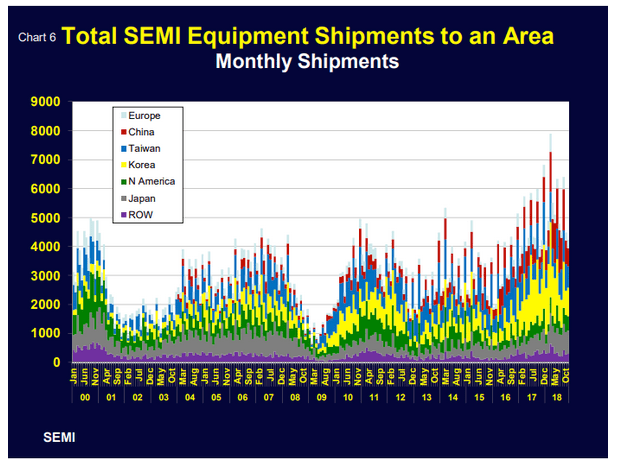 Semiconductor equipment shipments (Chart 6) actually contracted 0.6% globally for just the month of November 2018 vs. November 2017. 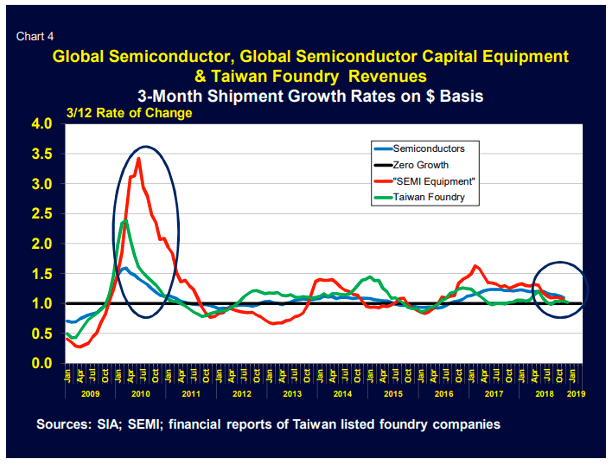 They are traditionally more volatile than semiconductor sales. This is exactly why I watch the likes of Equipment suppliers AMAT and LRCX as opposed to Intel or other chip makers, for example. These Equipment companies have been impaired by the US/China trade war and so with Trump and China making nice there is the potential for at least a cyclical bounce. As to SEMI’s conclusion below, if an industry expert says there is a “normal” winter slowdown, I’ll go with that. The political uncertainty is as easy to remedy as the Bull in the China Shop (Trump) realizing that he has been impairing his own economic cycle. The “memory shifts” noted are probably the over-supply of NAND on the market. The normal winter seasonal industry slowdown is upon us and it is being overlaid with economic softness, political uncertainty, product (memory) shifts and general industry weakening. The bottom line as I see it is that projections have been for renewed growth in Q2 or Q3 2019. Relief on the trade front would help there. Assuming the projections are accurate (always a valid question), we can watch AMAT, LRCX and the Equipment segment for any economic front-running they might display (as in 2013) or fail to display.